PREVOST Brand new Prevost IRC 61251 1/4" body air coupler. This is a very high quality Prevost coupler that features a non-marring, impact resistant, high grade composite body. This coupler is easy to use for anyone and is built for safety and high efficiency! The quick release button on this coupler allows you to easily release plugs with one hand! This coupler features a 1/4" female NPT threaded inlet. 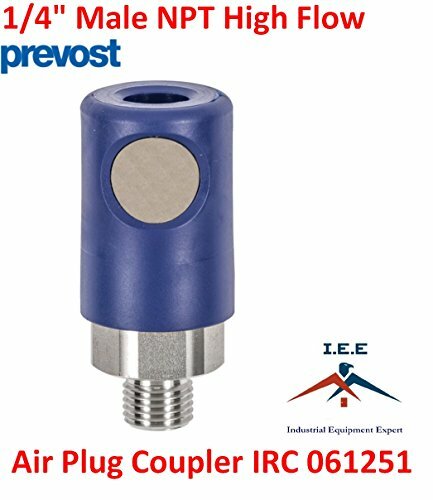 This coupler is compatible with Prevost Industrial Interchange Style air plugs and has a 3 year manufacturer's warranty. * Specifications: -1/4" Male NPT -Easy To Use -Anti-marring -Heavy Duty Composite Body -Steel Inner Construction *Warranty valid only if used with Prevost high quality steel plugs. Brand new Prevost IRC 61251 1/4" body air coupler. This is a very high quality Prevost coupler that features a non-marring, impact resistant, high grade composite body. This coupler is easy to use for anyone and is built for safety and high efficiency! The quick release button on this coupler allows you to easily release plugs with one hand! -1/4" Male NPT -Easy To Use -Anti-marring -Heavy Duty Composite Body -Steel Inner Construction *Warranty valid only if used with Prevost high quality steel plugs. If you have any questions about this product by Prevost, contact us by completing and submitting the form below. If you are looking for a specif part number, please include it with your message.